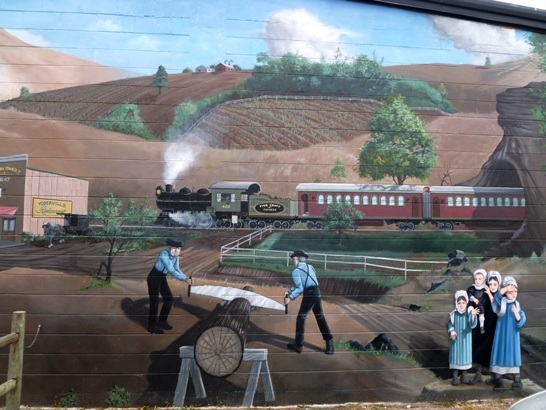 I recently came across a few images of Amish-themed murals. This first one is found on Bahia Vista boulevard in the Florida Amish community at Pinecraft, Sarasota. I’m not really an art person, but I usually enjoy murals when I meet them in my travels. Maybe it’s just the element of the unexpected, in finding a massive piece of artwork outdoors. I also like how murals are usually a little rough around the edges. I suppose the imperfections have much to do with the uneven surface artists must work with–often brick or cinder-block walls. Not to mention their constant exposure to the elements. The Holmes County, Ohio settlement is a place with a good deal of murals, or mural-style art, for instance at the Sugarcreek McDonald’s or Guggisberg Cheese near Charm. The McDonald’s art, a winter buggy scene, greets you as you pass by the wall of the drive-thru. For that matter, Sugarcreek seems to have fully embraced mural paintings, with numerous spots in the town featuring the outdoor art. Also in Holmes County, Behalt is technically an indoor cyclorama, but probably the best-known–and largest–example of art featuring Amish subjects. Painted by a German artist, Behalt is a pictorial representation of Anabaptist history. You enter the large circular room with a guide who explains the various events portrayed in the enormous painting. I have been racking my brain trying to recall other examples of Amish-themed art I’ve seen around the country. Help me if you can! I like the pictures and the art. 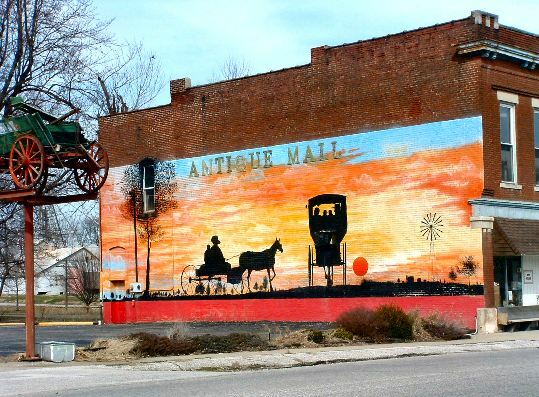 We do not have Amish themed murals here but last year our town started to have several murals painted reflected its rich Abraham Lincoln history. They are really cool. I think murals are way of attracting tourists. No matter what the art work just about everyone finds murals interesting. Not to mention they bring new life to an old dead looking building. Thanks for this Erik!! I think I will be keeping my eye on the Arthur area to see if there are any murals down there or if any spring up soon. The top photo is an especially good example of mural art – well executed, as I can make it out, and well-composed. I lived in a neighborhood in DC years ago that attracted mural artists – lots of exposed end walls, but none of it was Amish inspired! One of the local small town used books store carries some art work by a local Amish women. Also, a local Amish man has published 4 or 5 small books (mimeographed ~ 40-50 pages on 81/2 x 11 paper) about his life stories, humorous. Wondered how common this is? I have an Amish painting that I got free when they were cleaning out an apartment in the complex I live. I would like to try to find out more about the artist. It is signed what looks like Selma with a small blue figuerine underneath that looks like a fish. I thought maybe her last name was Fish. I contacted a couple of places over the internet in Lancaster, but they couldn’t help me. I love the painting and won’t sell it I just would like to know more about the artist. There was a great mural inside the “Der Dutchman” restaurant in Danville, OH (Knox County.) It showed a family riding in a buggy. The horse looked rather wild, just barely under control. The restaurant has been closed for years. I wonder if the mural is still there. I love murals. Such a reflection of the community. My husband painted a mural on one of our outside walls. It really made our home even more personalized. Thank you for sharing. I love all art ! P. Buckly Moss paints whimsical pics of Amish Life, she has a studio/gallery in St. Pete, Fl. As for the Amish mural in Pinecraft, I thought I read it was redone or refreshed recently. Its raining “cats&dogs” here in central Fl. Glad you’ve enjoyed them Michelle. I guess I do have a lot of topics I can choose from. On the Pinecraft mural(s), as Prof. Stevick mentions above, there is actually more than one. But the photo I posted above apparently was taken just last week. I’ve seen older- and more faded-looking versions of the same image, so that might be the one you read about. Susan Fryman-I like your description as “reflection of community”. I think they often are. I know next to zero of the history of murals but in a way they’ve always felt to me like a very “American” form of expression. Susan Hamme-I wasn’t aware of those sculptures, but next time I’m in the area I will need to pop in. Don’t know if I’ll eat though most people who mention Shady Maple on this blog seem to love the food! When it comes to Amish artists, it is not common but not unheard of. Susie Riehl is probably the best known, she is an Amish painter in Lancaster County. Karen Johnson-Weiner described a New York Amishman who does paintings in her recent book New York Amish. I believe it is a hobby that he earns some money from. Like with most people art, even when you do see it, isn’t going to be anything close to an occupation except in the rarest cases. However some Amish might consider what they do “art” by another name–for instance the Amish cabinet maker or taxidermist both produce beautiful creations. In some cases there is much latitude for self expression in Amish occupations. some of that art work by the Amish woma, does that book store have an email address? I like the “Antique Mall” wall because I can’t help but wonder what advertising was painted on the wall before the current one went up. At the top you can just barely see fain writing, maybe. Reminds me of a time were I live when developers tore down a building and revealed an early, painted on, Coca-Cola sign on an older neighboring building. People snapped pictures of it and others walked by and, when I was there, quipped “I don’t understand why people would be so curious about a stupid old advertisement.” Simple answer is they don’t advertise like that anymore, and painted ads aren’t maintained and preserved. But I’m veering off topic just a touch, I guess. Actually Shom it is a good topic. I am always fascinated by these old painted fading wall ads myself. You don’t see them so much anymore. I have noticed some renovated tobacco ads on barns, I believe Mail Pouch tobacco was a popular one way back when. This comment isn’t about Amish mural art, but about an Amish artist. Christy Otto, from Topeka, Indiana, is an Amish artist who draws pencil and paper pictures, which he calls cartoons, of scenes from Amish farm/rural life, primarily focusing on produce farming. He has just published a book called The Story Behind the picture which includes 70 of his drawings (“cartoons”). Each one is accompanied by the “story behind the picture”. It is a delightful book that I think many Amish America readers would enjoy. Glad you mentioned this Al. Based on what I’ve seen he is talented.